I also hesitated to take the module because setting up the blog, getting to know the different functions of it, watching many educational talks to get myself inspired, not being familiar with the concept, and the time-consuming work at home writing blogs and leaving comments on other blogs with deadlines turned me off at the beginning. I wanted to keep the work load as low as possible. That was due to the fact that at the same time I was studying for the exams from Germany, because over there the first semester still hadn´t ended. I was basically working in two semesters at the same time, but differing in language. You may remember the scene when we talked for the first time shortly before the deadline to pick the modules. You asked me: “What do you think of all this?” or something similar. I responded with a doubtful voice: “Well, it´s different, I suppose”, crinkling my forehead. I told you that I would be going to have a talk with Tracy before deciding whether I would take the module and then come back to you. After a long talk with my parents back home and weighing out the options against each other I decided that I would have a try. Maybe it was curiosity that persuaded me. It was something new and exciting, a way of educating myself deciding on which topic I would like to pick. Blogs are information tools that last and that can inspire and inform other people, something that I could continue after the module is over, a first step into the blogosphere creating something totally on my own. Another consideration was that it would also look good on my CV, although that was really a minor reason I think. My first blog I scribbled down because of the lack of time, and I still didn´t know how to structure my blog, how to find fitting evidence, how to refurbish my blog with pictures, videos, links and alike. I did not really know anything and thought everything was restricted to the 25 psychological principles available. I abstained from any comments this week because the German exams were more important to me. Consequently, I was disappointed with my first grade, which probably was way below average. But this also motivated me to do better next time, then not having any conflicts with my German studies anymore. I worked hard and long on my blog and was stressed because of writing it shortly before deadline, but surprisingly it worked out well, much better than I expected. Writing the following blogs I recognized how my writing skills improved. 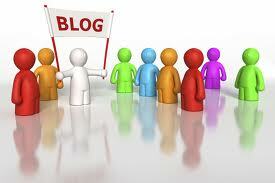 I learnt how to create my blog more interestingly with videos, pictures and the like. The more blogs I wrote the easier it felt to create new ideas, to write them down, to look for scientific proof…. With less time inverting in my blog, I kept up the high results, making me more confident. The talks I also began to enjoy. Actually inspired by Jack´s talk I began to focus on mindfulness, and I really enjoyed his comments on my blog and liked to comment on his blogs, really inspiring. I think that´s also an aspect that characterizes blogs, being connected with people of same interest, learning from each other. Mindfulness gave me a lot personally, and I try to integrate it into my daily basis. I learnt so much about creativity and arts and its connections to mindfulness, and was a little bit nostalgic about my childhood when I did not worry about tomorrow or ruminate about the past. However, I also found out that I lost some of my creativity that I had and this naïve living into the day growing up (Diana Winston, TED talk). Not the education system, not anybody was encouraging it. Anyway, blogging was the perfect way to enhance creative thinking again. And what´s more is that I can express my opinion in the blogs and promoted a change in education integrating mindfulness into the curriculum and taking more time for arts education. In the middle of the semester I did not understand how to access my video of the talk that I had to upload on my blog. Confused I came to your office, and I told you how positively surprised and excited I was and still am writing blogs. I am sure you sounded out that I enjoyed this module. Otherwise we probably wouldn´t have talked so long about different topics in education. I really enjoyed our conversation, and it spurted my motivation even further. You see, I have learnt from this module and it brought me to think more critically about our education system, be it in school or in University. Perhaps I could make a change in my University in Freiburg, advocating the teaching through blogs. This entry was posted in Uncategorized and tagged blog, Creativity, Education, TED (conference). Bookmark the permalink.